I really like this picture. As someone who dabbled in drawn artwork, I'm impressed by your skill with it. Wow, that is quite a long time ago, but nice illo!! Well done! And the rain is a great effect. here again to let you know how happy I am for finding so many great comments from you! That looks like Sleeping beauty from one of Walt Disneys charecters. That's really great! I like how some of the rain/puddles are reversed. very good. this is an excellent B/w illo. very nice, i can almost hear those splish sploshes. 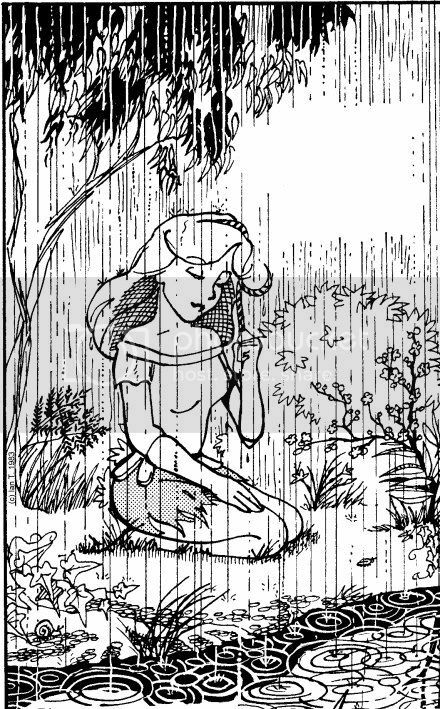 i like how the rain is going on all around her - letting her carry on contemplating under her tree, undisturbed. This is really something, Ian! Your rendering of the rain as it hits the water is quite amazing. I also like the little drop that's coming off her hair band. I admire the balance of this piece...just the right amount of dark and pattern. 1983...you must have been a mere child! oh this is so beautiful! her pose is so elegant! Hi Ian! I am glad I can upon this one because I really love this!!! Love the way you captured the rain in the water, the circles. Beautiful!!! Thanks, all! I remember the fun I had making this series of pages and I'm glad that still comes through in this pic. The really waterproof ink inspired me to experiment - I had used white for lettering and touches here and there before, but nothing quite like this.